CTLE Blog: Timely, constructive feedback - it's not just for students! Timely, constructive feedback - it's not just for students! Most instructors know that it's important to provide students with feedback on their performance early in the semester, so they have time to improve. But how many of us actually solicit feedback on our performance as teachers? It's important that we get feedback on our teaching so we can continue to grow as instructors and provide our students with the best learning experience possible. There are several sources from which to pull - we can ask students to tell us what they think, ask our colleagues to observe our classes or review our materials and offer advice, and we can seek out those trained in teaching and learning in higher education (such as the consultants at CTLE) to consult with us and provide guidance. 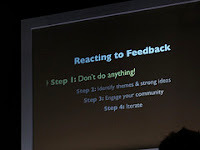 So how should we respond to feedback once we get it? First, look for themes, and try not to take negative feedback personally. If only one person says they hate the way you dress, this is not very useful feedback. But if many of your students, and your colleagues, suggest that your lessons are disorganized, this is something to which you likely want to attend. Unfortunately, students usually won't be able to tell us how to fix the problem. However our colleagues can provide examples of approaches they've tried, and teaching consultants can offer ideas, workshops, and resources to help. Some general advice, if you plan to change something based on feedback you've received, is to leave the structure of the course (e.g., course requirements and grading) untouched until the next time around, and to only change a few things rather than attempting a major overhaul mid-semester. Try to identify the one or two most important issues that could be addressed by making minor adjustments (e.g., incorporating more activities or discussion to liven up a long lecture class). Finally, make sure that you let students and colleagues know that you appreciate their comments, even if you are not going to make all (or any!) of the changes they've suggested. For students, you can summarize the comments, touching on the major themes that arose, and let them know what you will be doing to address any concerns. If you are not going to make a suggested change, provide an explanation (e.g., I won't be grading on a curve, because I think it's important that you meet the course standards rather than be compared to one another, and for some grading on a curve could actually hurt their grades). The Center for Teaching & Learning Excellence provides a wide variety of free and confidential services to help instructors at the University of Utah assess their teaching effectiveness, and we will also consult with you to help you interpret the feedback you receive and make decisions about how to make adjustments to your course. Review details and request services on our website.